· Recommendation (Might Likes TM) feature suggesting radio stations based on what iPod artists were listened to last. Recommendations are being constantly updated. · Find stations according to the artists or songs played on it or according to the content of the station’s web page. If you still hesitate with your decision which station to listen to among such broad choice, the TUN3R app will do that for you. All you have to do just press the "Might Likes TM" button on the search screen. The application will automatically look for the last ten artists played from the iPod library, and then will search for stations that play those artists. "TUN3R is a tactile application to begin with, so browsing on the iPhone's touchscreen feels very natural. Seeing is believing." said Neil Hepburn, TUN3R’s co-founder and general manager of marketing. "With the iPhone's recent iPod API integration, we saw an opportunity to create an entirely new kind of recommendation feature which we expect newcomers to Internet Radio will find very useful. As we like to say 'Your mood. 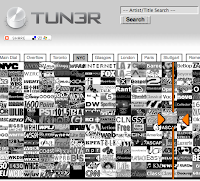 Your station'"
TUN3R plans to expand its business through its proposed Profit Sharing for Webcasters business model, which will provide users with high quality streams, and in turn compensate stations based on usage. The application is available on the Apple iTunes App Store (http://appsto.re/TUN3R).